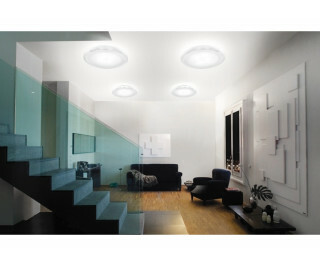 The Pod PP wall or ceiling light by Vistosi has been designed by Babled & Co 2005. The wall or ceiling light is made of semi-transparent white blown glass, with a central opal glass decoration. This oval centerpiece will make a statement in any room. This beautiful light has been handmade on the Venetian island of Murano. Every light comes with a certificate of authenticity.